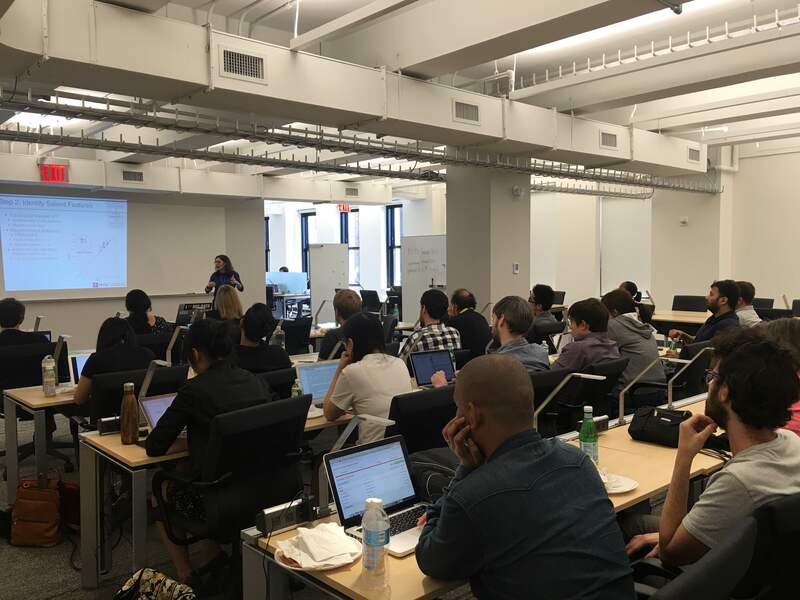 The Data Science Lunch Seminar Series is an informal weekly gathering of NYU Data Science affiliated persons to discuss data science related topics. Each week there is a 30 minute presentation, over lunch (provided), with additional time for conversation and questions. The series meets Wednesdays from 12:30-1:30 PM at the Center for Data Science. Justin Salamon, “Audio Source Identification in Urban/Bio-Acoustic Environments”. Topic: Quantitative Text Analysis for the Social Sciences (Using R): Natural language processing and quantitative analysis of social and political texts, using an R package called quanteda (http://github.com/kbenoit/quanteda) that he is developing. Topic: The hermeneutics of MCMC sampling: points of view about samplers, some of which don’t depend on your point of view. Topic: Better Cities through Imaging: I will describe how persistent, synoptic imaging of the NYC skyline can be used to better understand the city (in analogy to how persistent, synoptic imaging of the sky can be used to better understand the heavens), giving specific examples related to energy consumption, public health, and air quality which can lead to improved city functioning and quality of life. Topic: How Social Media Reduces Mass Political Polarization: Using a new method to estimate the ideological positions of social media users and their communication networks over time, I provide evidence that exposure to dissonant political messages on social media induces political moderation. For the paper, click here. In this paper, we fit a linear growth curve to the biomechanical data of grasping in order to understand the relationship between fingertip forces and object weight among healthy subjects. Our results show evidence of feedforward control during the grasping task when healthy subject grasp/lift an object with familiar weights. This talk will give an introduction into astronomy at very short wavelengths, where we see the universe’s most extreme phenomena, and showcase typical data analysis problems—some of which we are working on at the CDS—which we have to solve in order to understand the underlying physical processes. Discussion of some methods for finding low-rank submatrices within gene-expression data; It will be necessary to correct for case-control status as well as covariates. Dynamic mapping of non-ocular spatio-acoustic energies. Networks are ubiquitous in today’s world. Any time we make observations about people, places, or things and the interactions between them, we have a network. Yet a quantitative understanding of real-world networks is in its infancy, and must be based on strong theoretical and methodological foundations. The goal of this talk is to provide some insight into these foundations from the perspective of nonparametric statistics, in particular how trade-offs between model complexity and parsimony can be balanced to yield practical algorithms with provable properties. This talk will cover methods for structure and parameter learning in latent variable models and discuss an application for learning diagnosis models from unstructured data in electronic medical records. I hear from non-ML as well as ML researchers once a while that they find it difficult to work with neural networks due to the lack of interpretability compared to other simpler models which are in many cases some variants of linear models. This has always made me wonder if there is a natural tradeoff between interpretability and modelling accuracy. In this talk, however, I argue that no such tradeoff exists, which has been argued already more than a decade ago by Breiman (2001). Furthermore, I present some recent results from deep learning showing that seemingly complex models, such as deep neural nets and recurrent neural nets, are in fact interpretable, if we try hard enough.